Cut off roots and leaves and remove any tough strings. 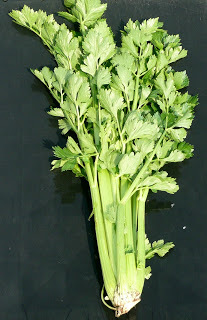 Separate the stalks and cut into 7cm lengths. Rinse well. Great raw, or may be sliced and boiled for 6 minutes or stir-fried for 4 minutes. May be served buttered or with warm vinaigrette or cheese sauce. Prepare as above. Blanch for 3 minutes. Pack in bags and freeze. Not suitable to be eaten raw. Cook from frozen in boiling water for 10 minutes, or add to casseroles. Fry celery and onion over low heat for 10 minutes until soft but not brown. Sprinkle on flour and stir until well coated. Remove pan from the heat and add the milk gradually, stirring well until smooth. Return pan to the heat and bring to the boil, stirring continuously until thickened. Season and simmer for 15 minutes. Add crumbled stilton and heat for further 5 minutes, stirring to prevent cheese from sticking. Serve with a little crumbled stilton and a sprinkling of paprika. Serves 4. Fry the celery until just beginning to brown. Remove from pan and set aside. Fry onions until brown. Sprinkle over flour and stir until smooth and gradually add stock, stirring constantly. Add Marmite. Bring to boil, stirring, until smooth and thickened. Season to taste. Place celery in ovenproof dish and pour over sauce. Cover and bake at 180C/Gas 4 for 40 minutes. Serves 4. Fry the onion, celery and garlic at a moderate heat for about 10 minutes. Add the flour and mix well to coat. Gradually add the stock and stir until the sauce thickens. Stir in the cream and season to taste. Dry fry the almonds until golden brown. Chop and sprinkle over top before serving. Serve with freshly cooked pasta. Serves 4.